Congress President Rahul Gandhi today released the party manifesto after addressing a rally at Rajnandgaon. The highlights of the manifesto, called "People's Manifesto" are the promises of loan waiver along with minimum support price for the peasants on various crops. Addressing the acute poverty in the state, Congress has promised 35 kg of rice at a cost of Rs 1 only every month. 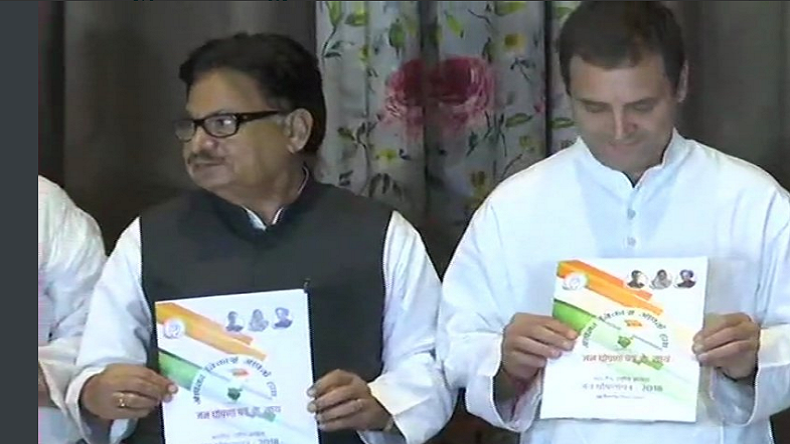 With only 2 days to go for the first phase of Chhattisgarh Assembly elections, Congress President Rahul Gandhi today released the party manifesto after addressing a rally at Rajnandgaon. According to reports, the manifesto has been drafted after taking inputs from farmers, women representatives’, workers organisations, students, teachers, mining workers, Tendu Patta workers, tribals, businessmen, doctors, nurses, political outfits, housewives, lawyers, amongst others. The highlights of the manifesto, called “People’s Manifesto” are the promises of loan waiver along with minimum support price for the peasants on various crops. Addressing the acute poverty in the state, Congress has promised 35 kg of rice at a cost of Rs 1 only every month. Giving priority to women security, strict enforcement of laws, setting up new women help cells in each police station along with some special women police station have been promised in the manifesto. Rahul Gandhi, today while addressing the rally attacked PM Modi over unemployment and the same has been tackled in the list of promises. Proposing job security, more opportunities and help in ease of doing business for minority communities have been promised. On the Educational front, the manifesto promises to improve the quality of teachers. Apart from that, there is special attention to dealing with nutrition and anaemia in school kids. In the health sector, Air ambulances will be provisioned for areas like Bastar, Sarguja, and Supebeda while several medical colleges may be converted to multi-speciality hospitals, as per the manifesto.